Pop quiz...which one is the yogi and which one is the commissar? PARADISE FOUND was one of the more spiritually complex and symbolically dense episodes within the universe of Xena: Warrior Princess. There has been much written in regard to the often tangled moral attitudes of our two main characters. Xena's dark and violent aspect is effectively contrasted with Gabrielle's good and passive outlook. In this sense, the episode was delving into well-trodden territory. My initial reaction to PARADISE FOUND, without having first read any reviews or other analysis thereof, was the striking similarity to a well-known essay by a favorite author. The essay is "The Yogi and the Commissar" by Arthur Koestler. This article then, will attempt to illustrate the interesting correlation that exists between the concepts discussed within Koestler's essay and the episode PARADISE FOUND. If nothing else, for those of you well acquainted with the episode, it may offer a very brief insight into one of the most important thinkers of the 20th century, Arthur Koestler. I will offer a short overview of the man and the essay. Arthur Koestler (1905-1983) was a writer deeply concerned with moral and particularly ethical issues. Like his contemporary, Albert Camus (1913-1960), existential issues relating to man's essential condition fascinated him. His first novel Darkness at Noon (1982) was a work more of philosophy than narrative imagination. He possessed a vibrant sense of humor, but always retained a focus upon the problematic nature of man's existence. 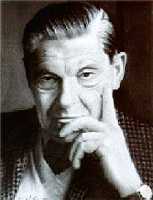 Koestler was fascinated by the workings of the psyche, or in other words, what makes a mind tick. His books: Act of Creation (1967), The Ghost in the Machine (1976), and Roots of Coincidence (1973) all in some way struggled with the subjects of spirituality, motivation, creativity, and free will. Like many of the writers of his generation, Koestler saw no clear distinction between spiritual and political ideas. He felt that the two concepts were inextricably interwoven. He strove to extend the bounds of the knowable, by pushing his intellect to the limit. Sadly, the struggle ultimately proved to be beyond his strength. Like the character of Xena, Koestler was inflicted with personal demons. After a difficult struggle with illness, he took his own life in 1983. The essay "The Yogi and the Commissar" was written in 1945. It is essentially a disquisition illuminating the two opposing ends of the political spectrum. The nature of the article is such that the political overtones have spiritual relevance also. The "Yogi" is an archetype representing the dispassionate spiritually enlightened seeker of truth. This individual eschews all forms of violence and instead embraces a doctrine entailing "pure love" as an end unto itself. All temptation, action, and reaction are avoided. A state of transcendent peace is prized above all else. Although the external world is regarded as being real, it is of secondary importance to the internal reality of the mind. A similarity exists here with the characters of Gabrielle and Aidan in PARADISE FOUND. Eli was also an example of this spiritual archetype. It might be noted that this "Yogic" Gabrielle was not a representative example of her overall true nature. Obviously the deceptive and persuasive character of Aidan had lured her into adopting an extreme point of view. Though, it is also true that this perpetual compulsion to explore this inner aspect of her spirituality, was a consistent feature of Gabrielle's personality throughout the show. By marked contrast, the "Commissar" is the person of action and adventure. This individual yearns for physical conflict and actively seeks to alter her fate. Spiritual redemption is a subject of little value to the Commissar. Passive transcendental meditation would be of no interest whatsoever. Political revolution is this being's currency. Violent overthrow is seen as a viable means of change. The character of Xena, though not admitting to possessing specific political views, nonetheless strongly resembles this twentieth century iconographic figure. Xena's harsh and manipulative attempt to end Julius Caesar's reign might be regarded as an illustrative example of her politically astute nature. What follows here is a brief synopsis of PARADISE FOUND for those of you unfamiliar with the episode. Gabrielle falls down a hole in a clear allusion to Alice in Wonderland. Xena follows her down this hole. They emerge in a bewildering fantasy world not unlike "Illusia" from THE BITTER SUITE. They encounter a seemingly beneficent and benign guru by the name of Aidan. Gabrielle is intrigued by Aidan's message of peace through perfect inner stillness. Towards this end, she proceeds to familiarize herself with the techniques of transcendental meditation. Xena is typically suspicious of Aidan and his message of peace. She rejects his teachings. Contrasts are made between Xena's active, dark side and Gabrielle's passive, inner goodness. Eventually, Xena realizes that her dark side will physically do harm to Gabrielle. She leaves. 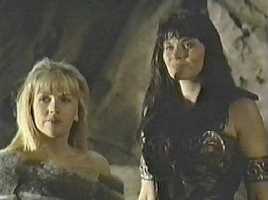 Xena then discovers that Aidan is actually evil and has been planning to drain Gabrielle of her innate goodness. Gabrielle has been completely duped by the malevolent Aidan and is nearly "emptied." 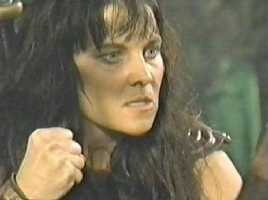 Xena is able to defeat Aidan by embracing her violent, animalistic nature. This darkness in turn is utilized to defeat Aidan. Gabrielle is awakened from her deep trance by Xena's threat against the innocent Gar (a minor supporting character). The episode ends with the vanishing of Aidan's illusory realm. Gabrielle notes the irony of the fact that the very aspect of Xena's persona that she had always considered so detrimental has saved them. Shame on you, Aidan! Shame! Gar, an individual who has resisted Aidan's charms through sheer obduracy, makes this accurate appraisal of the moral stagnancy of the place, "[G]oodness in a perfect place going to waste without evil to keep it alive and fighting." The Yogi's creed is explained in the following quote. Certainly the above would not be a perfect reflection of Gabrielle's overall vision. However, the definite appeal it holds for her cannot be denied. She remarks to Xena, "I wish you could see how right this feels for me." Gabrielle is forever tempted by the hope for a world of perfect peace and charity. She is an idealist, and some would call her na�ve. Charlatans making grandiose claims of spiritual superiority do not easily lead Xena astray. It is not that Xena is more intelligent, but rather that her extensive experience with human nature, in all its faulty manifestations, provides her with insights not yet comprehended by Gabrielle. We may clearly see Xena's attitude in the previous remark. It is certainly not a matter of Xena lacking a vibrant intellect. Rather, she is a realist and a pragmatic follower of tangible truth. To wit, a less rigorously pragmatic woman might well have rationalized away the guilt and shame which constantly had plagued her. Xena thinks with her sword and reasons with her chakram. It is not difficult to imagine Xena as a twentieth century embodiment of political reform. She would surely not suffer the sort of dictatorial, maniacal infamy of a Stalin, Hitler, Pinochet, or Franco. Her Commissar nature would actively seek out an end to the injustice perpetrated by the modern-day Caesars. In this way, we see her as a fitting example of Koestler's archetype. PARADISE FOUND ends with Gabrielle realizing that Xena's darkness has saved them. For her part, Xena seems to cautiously accept this explanation. Does this then suggest that Xena's path, the spiritual way of the warrior, which is roughly equal to the political methods of the Commissar, is superior to Gabrielle's vision? It is suggested here that even Xena does not believe this to be the case. The warrior Commissar has an innate sense that her way ultimately leads to annihilation: not only for herself but also for the society as a whole. Xena's basic 'law of the jungle' must eventually succumb to its own spiritual emptiness. Xena understands that Gabrielle's way of the Yogi has an important part to play in world affairs. Gabrielle has a similar divided sensibility in regard to means of spiritual and political change. Unlike Xena, she is powerfully drawn to the message of peace proselytized by the Yogi. Yet even during this fascination with the "way of love", as expressed by Aidan and Eli, she retains a glimmer of her violent nature. On the surface, it seems that Gabrielle's vision is perhaps less balanced than Xena's. It is her youth, her inexperience, and her innocence that allow her to retain this idyllic hope for a world without war. As Gabrielle's character evolves and matures, she clearly grows ever closer to Xena's belief in aggressive, skillfully applied force. In PARADISE FOUND both characters learn something about their respective inner selves. The very fact that Xena was attempting tai chi-type movements suggests that the methods of inner enlightenment were not entirely lost on her. Gabrielle conversely, comes to appreciate the vital importance of direct action, as opposed to detached contemplation. Xena the Commissar conquers her demons through sheer force of will. Gabrielle the Yogi tempers the fiery, tempestuous confusion of Xena's dark side through compassion and understanding. Over time, it appears that their spiritual and political natures become inextricably entwined. One cannot exist without the other. So it is with the world as a whole. Both of these diametrically opposed ways, that of the Warrior-Commissar, and that of the Priest-Yogi must necessarily exist, but always in a complex dance of aggression and appeasement. Arthur Koestler, The Yogi and the Commissar, pg. 12. Bradley Danbrook is a 38-year-old who has recently relocated to Nova Scotia. His past twelve years were spent at the Toronto Star newspaper. He now works occasionally in television production, and is working on a novel. He is still lamenting the loss of our beloved hero, Xena.